Alright my fellow Truebies, let's admit something really big to ourselves and the world: We have been wanting Sookie to die for about... oh.... probably six and a half seasons. Yes, it's a horrible thing to say, even about a fictional character, especially the main character. But yes, you know it's true, I know it's true, anyone who has ever watched Sookie whine and pout her way through an episode knows it's true. So when we heard whispers and rumors about one of True Blood's primary characters dies in Season 7 as a result of the war between the Hep-V infected vampires and everyone else, I know you all felt the same thing I did: For the love of Lilith, please let it be Sookie. I mean let's be honest, there are rumors about Eric being the character to go, but surely the show's creative team knows as well as we do that without Eric's chiseled face and the infamous peen-in-the-snow scene, we might have jumped ship a season or two ago. Even die-hard True Blood fans can admit to themselves that they stick around for Lafayette, Pam, the hope that Jessica and that hot new vamp James will get it on, that we might get more than a mere glance of Eric's package, but most certainly not because anyone cares about Sookie. 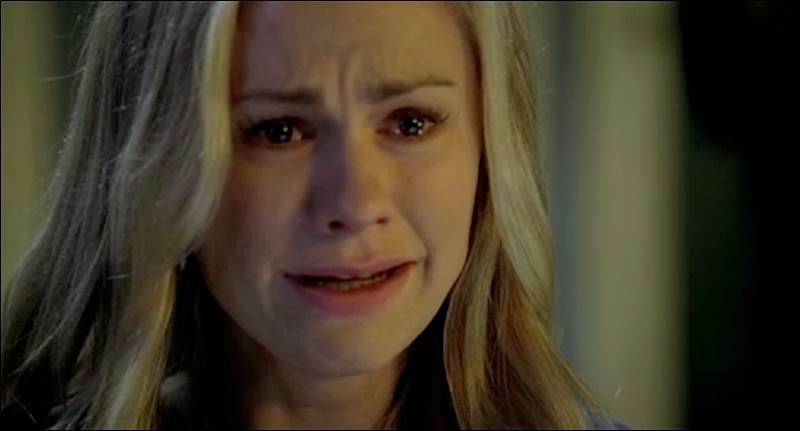 Let's just face it people, Sookie Stackhouse is the angry zit on the stunning face of True Blood, even if she is the center point of its plot. For one, the endless slew of sickeningly attractive men who are willing to throw themselves at her feet does not make any sense. Secondly, she is an embarrassment to empowered women and empowered female characters everywhere, given that all she ever does is yell at men, stomp off, act like an idiot, get with another guy, and then rinse and repeat. Placed alongside the likes of Pam, Tara, even Arlene, Sookie is a sad, half-assed representation of womanhood that is all about teeny shorts and whining, and not at all about self-sufficiency or intelligent thought. Who needs it? The show would be much more compelling if we just replaced Sookie with Lafayette and let it roll from there. If we're going to lose a primary character early on in the season, I'd rather have the last few episodes to revel in the glory of some seriously great characters without the incessant self-pity that is Sookie's calling card. Sorry that I'm not at all sorry. Just imagine, a world in which Jason Stackhouse is free from having to save his sister at the direct risk of his own life. Imagine a world in which Alcide is less troubled and pensive, but more naked and... naked. Imagine if Bill and Eric weren't busy either having angsty stand-offs with Sookie or each other, but were actually free to do whatever it is ancient vampires/demi-gods do in their spare time. In that world, True Blood might actually be good again. But oh well, in all likelihood, Sookie will never die and she'll probably end up being with Alcide for the rest of time, and everyone else we care about on True Blood will either be killed by infected vampires or simply fade in the background.